Chester McBee. And a Memorable Mishap. I’ve decided to name M squared after my small SC hometown: McBee. Despite the spelling, McBee is pronounced Mac-Bee. So, we’ll call him Mac. 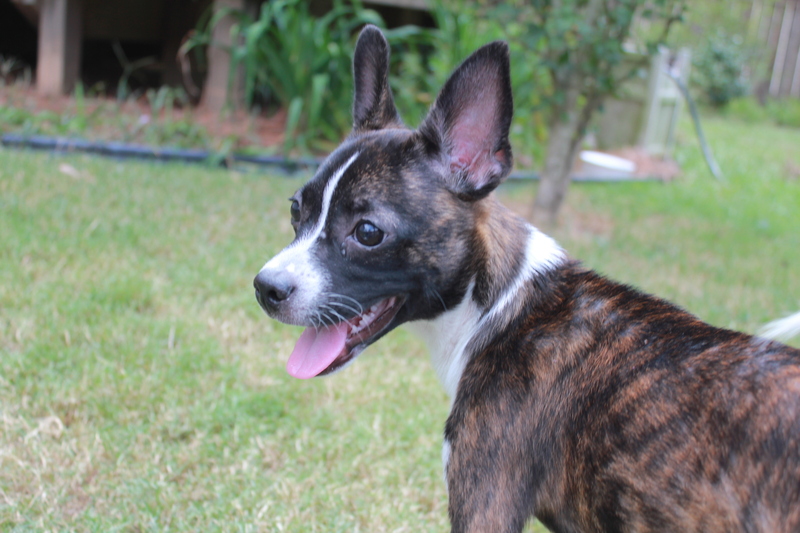 Chester Mac is a 4-month old Boston Terrier/Chihuahua mix. He’ll be 15 lbs. at the most full-grown. He’s timid at first, but he comes around quickly and is friendly to all once he feels safe. He’s up-to-date on shots (I took him today), and he’ll be able to be neutered soon. I plan to schedule that in the next week or so. I wasn’t planning on getting Mac. But, Chester Florence/Molly’s mother, Sue Crow, told me about Melissa, who will be moving to New York next week. 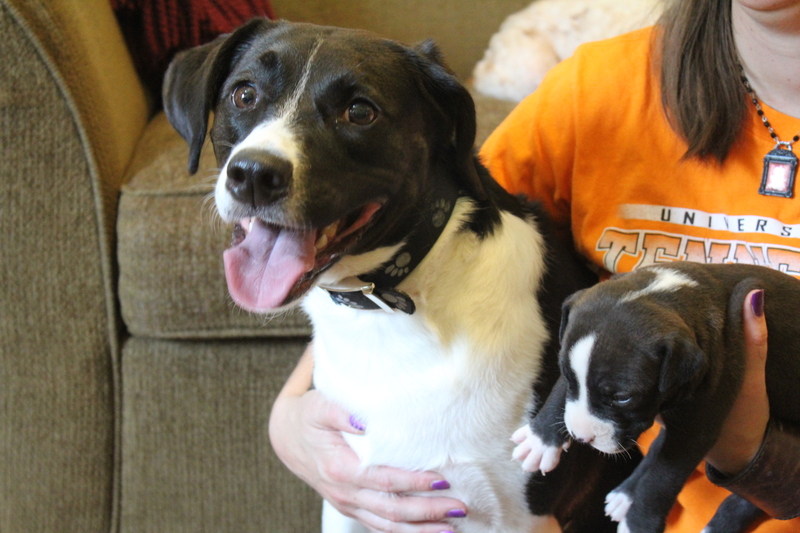 Melissa is unable to take Mac with her, but she promised her kids that she’d find Mac a good home. She thought she had, but Mac chewed up a pair of expensive shoes (note: never leave expensive shoes on the floor when you have a 4-month old puppy) and found himself homeless. Melissa took him back, and tried to find him another home. Time is running out, though. So, Sue sent me a facebook message. The Scott/Lexi introduction did go well. It helps that Lexi instantly adored S. and wanted to follow him everywhere. It also helped that I was able to tell him that the other extra dog in our house is one that we’re puppy-sitting rather than fostering. See Harper below. She’s just spending the weekend with us! — and getting acquainted with her new brother Chester Cayce, renamed Truman. So, I told Scott about Mac. And he told me to go get him. Because S. is a good man. And we have the same number of dogs we had before. We lost two this weekend. Sadly, Gaffney passed away (see previous post); Happily, Isla was adopted! Yay for Isla! She went to her new home today. See her, below, waiting for her family. 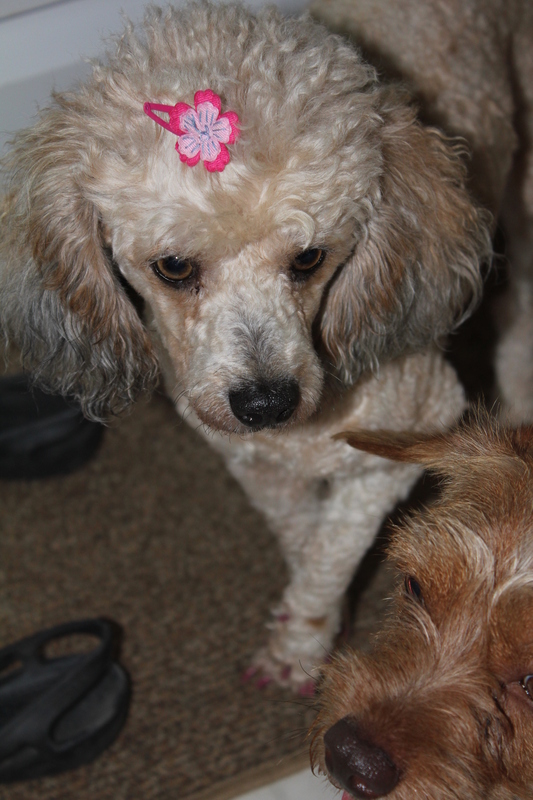 She’s all dolled up with pink nail polish and a bow that makes her look like a flapper. Special thanks to Krystal, Gregg and Emily, who were able to look past a crippled leg and a Golden Girls hairdo, and see how special Isla is. He looks like the offspring of Chester Kincaid (also tiger-striped) and a bat. 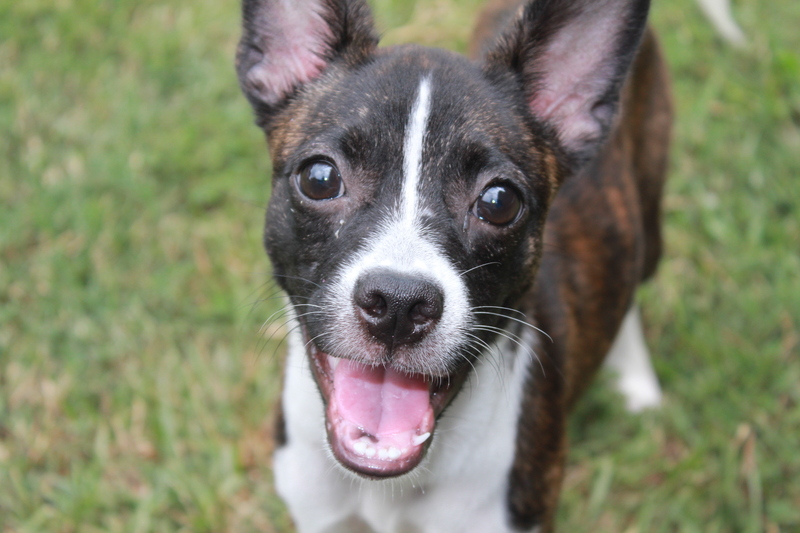 If you’re interested in adopting or fostering such a dog, send me a message! I lost a pair of shoes. — my most comfortable flip flops. I lost them because of the dogs, but not because the dogs chewed them. Edisto the Wonder Dog (aka Houdini) has figured out how to break out of our fenced backyard. And, always wanting to be the cool kid in town, he’s let Abbie Faith and Kincaid in on the secret. So, I found Edisto’s escape route and blocked it. Then, I found an opening in another part of the fence that separates us from the reserve and went to find the dogs and bring them back. The trail was more overgrown than I remembered it, and by the time I found Kincaid, I thought I’d try to find a shorter and easier way out. I got lost. Really lost. 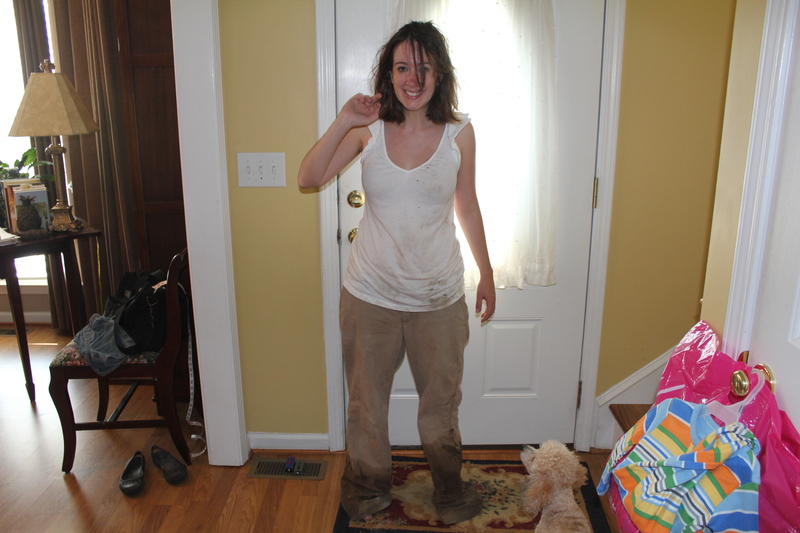 I tried to cross a stream, thought that I stepped on solid ground, and sunk to my calves in mud. I dragged myself out, losing my shoes in the process. Then, I had to walk over a field of gumballs in my bare feet. Treacherous. When I finally found the back of my house, I pushed down the barricade I had made and climbed under the fence the same way the dogs had. But, it looks like I’ll be getting a new pair of shoes now. Not so dumb after all. 2 dogs and 1 new pair of shoes. Best Labor Day weekend. Ever.